Cafe Papeneiland is a cozy and authentic Brown cafe in the city. The destination is famous for its drinks and food that makes it a must place to visit. With good service and friendly staff this destination comes highly recommended by travellers and locals alike. Even the architecture of the cafe and the interiors are set up so as to give a rustic look to the whole area. Take a bus or tram from Amsterdam, NieuweWillemsstraat. 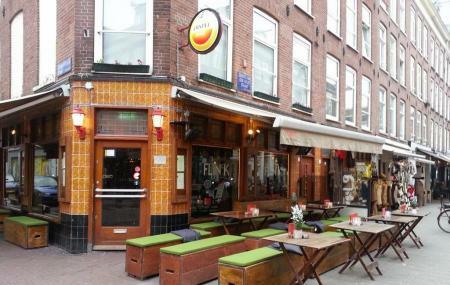 The neighborhood for Het Papeneiland is so quiet at night but this little bar is full of life! We ended up here on our way to Vesper and it was a great stop for a beer. The doorway is narrow but the interior has a good amount of space. The bartender was kind enough to take pictures of me and my boyfriend (it was my birthday, I was drunk, and needed someone to document me in a lovey state). Loved the real candles on the bar... this place is great! Charming, very old "brown" bar built in the 1640's. The vibe is very chill and relaxing. They do not play music which honestly was a wonderful change. You could actually talk! They served Amstel out of a beautifully ornate 100+ year old tap. The service team were very friendly and inviting and obviously proud of the bar and history. They have a good light bites type of menu and homemade apple pie. The smell was delicious as the pies cooked in the kitchen in the basement. We felt lucky to find the spot. A beautiful original little cafe/bar. The food is very good (I would highly recommend the apple pie) and staff are friendly. Will definitely be back. Wonderful service and a beautiful interior. I had a well rounded trip with a slice of apple pie, an espresso, and two Amstels. As a solo traveller it was a great place to sit and listen as the locals came in and out around the end of the business day.